Whereas I spend my entire life living the opposite side of this. I will spend fifteen minutes looking in the pantry for something mom needs, not be able to find it, and when I tell her "Mom, I think we're out" she comes to look and I swear to god it just immediately materializes out of the ether as soon as she walks over. you should just go comment on his post , everyone will thumb you up . Nice comic and it applies directly to my kids. Question: I saw someone post this on Facebook (with attribution to you) with your mallard instead of the duckling, and they changed the word "kids" to "husband." Did you do that or has someone been photoshopping your work? Sent a note to Mr Lopez via twitter. Whether he ever sees it or cares to respond is another thing. Sadly, the whole URL cropping thing happens way too often by folks who evidently want to make it harder for artists to keep making the stuff they want to share. Friday, July 24th @ 11:29 am by Deb G.
Thursday, July 23rd @ 10:06 am by Deb G.
This image was shared by George Lopez on Facebook. 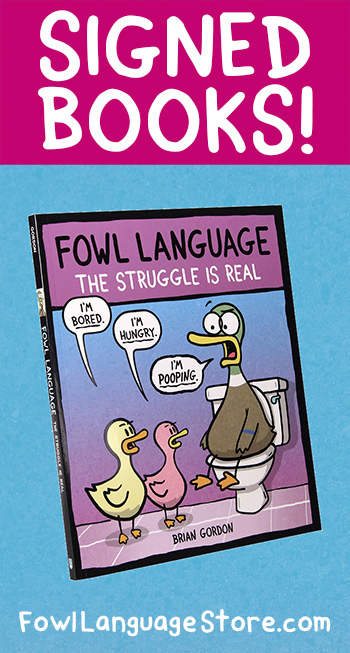 Unfortunately the fowl language info was cropped off! You deserve credit for your work. I hope you get it! Ugh! So, so true! Loll! Your comic is fantastic. Nearly every post is a gimps into my life right now. Rather scarey, actually. It is clear to me you really do have children. It is like my life is a cliche and you are bringing it to light.